Welcome to our Green page! I’m Betty Spencer Dickey, the new Western Jurisdiction Guide working through the National UMW Environmental Justice Department. My role is to work with UMW Conferences in Alaska, California-Nevada, Oregon-Idaho, and the Pacific Northwest. 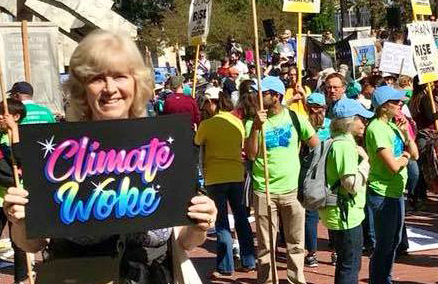 I am available to help women from local, District and Conference UMW be better stewards of resources when they have their meetings and be advocates for our planet and those who are affected by the injustices that result from climate issues. Contact me at bettybegreen.just@gmail.com . National UMW Climate Justice: Be Just. Be Green. Lots of ideas and activities are listed here! Especially see the “13 Steps to Sustainability” with instructions for you to make your meetings and programs better for the earth and for the people who attend. Climate Justice Simulation. This is a role-playing exercise that I can lead your group in, to understand some of the concerns of an environmentally degraded community. It takes about an hour, and could be an interesting experience for your circle or local group. Campaign to sign a letter to Chevron asking them to catch up with its peers in reducing methane leaks at its plants. Chevron Corporation is the second biggest emitter of carbon dioxide in the world since 1880. Read about the campaign already started and help us to continue to keep the pressure on this company. Become a Be Just. Be Green Advocate. When you submit the Advocate form, you will receive periodic news, updates, tips and special training and service opportunities by e-mail from your jurisdictional guide and the national advocacy team.